This week, an [article] was published in which the authors try to answer the question: “How many times did whales become big?” In biology, there are a couple of ‘rules’ about how large body size is evolved. 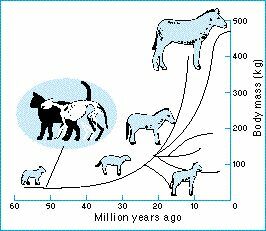 Cope’s Rule says that over evolutionary time, lineages of animals tend to get larger. Now, biological rules are not scientific laws (laws are backed by lots of scientific experiments and are considered to be true, like the law of gravity). Biological rules can, and do, have many exceptions, but can sometimes be useful in addressing evolutionary questions. An example of Cope’s Rule using horses. When horses first evolved, they were small, and got larger as their lineage continued to evolve. Now, does the evolution of large body size in whales follow Cope’s Rule? To answer this, the authors compiled a list of all known stem baleen whales (that’s all the baleen whales that are not within the living baleen whale group), their body sizes, geographic locations, and geologic ages. Because the relationships of baleen whales are not well-known, they used three different phylogenies (diagrams of evolutionary trees) to test out how body size changed in this group over time. A living blue whale with a human for scale. They’re tremendous animals. By using the body sizes of the known fossils, paleontologists can use a method called Ancestral State Reconstruction to make an educated guess about what size the ancestral form was. They found that having a small body size was more likely for the ancestral form, and that large size was independently evolved multiple times in baleen whales. However, some recently extinct forms also evolved small forms. So Cope’s Rule is not enough to explain body size evolution in whales. A drawing of the early whale Herpetocetus morrowi, with a human for scale. From Adli et al. 2014. A larger early whale, Llanocetus, with a human for scale. This entry was posted in English and tagged Ancestral State Recontruction, Body Size, Cope's Rule, Whales. Bookmark the permalink.